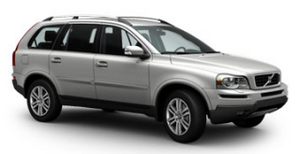 Seating either five or seven people, the XC90 has a 40/20/40-split second-row bench. With the seven-passenger configuration, a child booster seat in the second row can slide forward, nearly between the front seats. Two separate seats make up the available third row. All seats except the driver’s may fold down. The gauges and controls are angled slightly toward the driver. Options include a rear-seat DVD entertainment system and a Road and Traffic Information (RTI) navigation system with a pop-up screen.